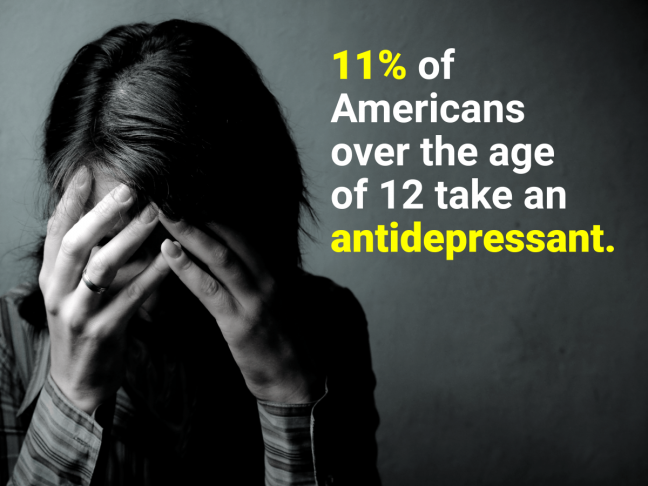 It’s a sad state of affairs that today so many people are reliant on anti-depressants to manage their life. As someone who has suffered intense depression, I know how bad depression feels. I ended up in hospital many years ago with severe depression, but intuitively I knew I did not want to take medication. Actually I tried it for about 3 days, felt 10 times worse, and stopped it, and instead chose to find a different way out. We can get to the root cause and clear depression, in many cases without the need for medication or supplements. This is my wish for anyone – to not have to be reliant on drugs to manage depression, because managing it with drugs will hardly ever get to the root cause and clear it at a foundation level. Depression is very often the ‘de-pressing’ of emotions, both ‘good’ and ‘bad’, or rather and to be more accurate, ‘happy’ or ‘unhappy’ feelings. In the case of depression, all the feelings, both ‘good’ and ‘bad’ get ‘de-pressed’, leading to the horrible feeling of ‘depression’. So what are the feelings we are de-pressing and why do we de-press them? Well, they can be any and all feelings, but in particular the most common ones which I have found lead to depression are emotions such as sadness, anger, fear, jealousy, frustration, hurt, guilt, shame, loneliness, boredom, lack of joy, disappointment etc. And why do we de-press them? Because we are unconsciously afraid of feeling them. According to psychologists, one of the greatest fears for a human being is to feel our feelings fully. As a result of this when the feelings arise from within, we either don’t notice them, or we half notice them and suppress them as quickly as possible. The problem is, feelings are literally a form of energy (go check out quantum physics theory to learn more about that) and once energy is generated, it’s a law of physics that this energy cannot be destroyed or just disappear into thin air. Instead, we have to learn to transmute this energy, which can easily be done if we know how. So why are we afraid of feeling our feelings? Because when we grew up somehow or other we learnt it is not ok to feel my feelings or have feelings or show my feelings, because if I do I will be rejected or judged or criticised or punished (you fill in the blanks for the consequences). So unconsciously at a very early age we teach ourselves to ignore our feelings rather than feel rejected etc, because for a young child this lack of love could (in our little child minds) lead to abandonment and therefore inability to literally survive. But remember, all of this is set up at an early ageunconsciously. And the ramifications down the track years later are huge. The solution? We must learn how to become aware of what we are feeling underneath the de-pression, which means we need to learn how to identify the feelings, accept feelings, and then transmute the emotional energy. This can all be done – it’s a skill, and it can be learnt. (See resources at the end of this article). It’s so vitally important to understand that there are no ‘good’ or ‘bad’ emotions: they just are. It is our mind that judges them and separates them into ‘good’ or ‘bad’. Emotions are a sensation felt in the body. They are a form of feedback from our body to our mind to tell us how we are feeling about a certain situation. They are constructive feedback from the body to the head. If something feels right for us, we will feel ‘good’. If something doesn’t feel right for us we will feel ‘bad’. Unfortunately, due to many of these emotions being experienced in childhood, and not knowing how to deal with them, we come to erroneously think we ARE bad if we feel ‘bad’ emotions. This is not true! They are just a feeling, and all feelings are welcome. They are the truth of how we feel. Imagine a battery: would you say that one end of the battery is good, and the other bad? NO! Each end just has a different polarity, and both serve a purpose and are needed. If you didn’t have unpleasant emotions how would you know the difference between that and good-feeling emotions? We live in a universe of polarity, it’s just physics. So we need to understand that feelings are feelings, and we don’t have to judge any feelings as wrong or bad. They just are. It’s what we do with our feelings that matters. So what are you doing with your feelings? Are you noticing them? Are you acknowledging and accepting them? Or are you resisting them? Because what we resist persists! The more we resist our feelings and sweep them under the carpet, the stronger they become, and the more havoc they play. Now that you know that all feelings are ok, and that you are not ‘bad’ for having feelings of anger, sadness, jealousy, shame, guilt…. you can start to acknowledge them. When we shine the light of our conscious awareness on our feelings, they start to transform. This is internal alchemy. Al-chemy. All-chemistry. We change our chemistry. (For more on this see Candice Pert’s book ‘Molecules of Emotion’ which explains how our feelings literally change our chemistry). Sunlight is crucial for our health and wellbeing. Unfortunately as modern-day, westernised humans we spend far too much time indoors. Have you noticed how when you go outside your body immediately breathes a sigh of relief and relaxation? We need sunlight to feel good: it stimulates seratonin production, which is an essential hormone for happiness. Breathe in the sun into every endocrine gland in your body (go google your endocrine glands if you don’t know where they are. You should know, it’s your body!). Notice how you feel after doing this exercise. What has changed? Do this exercise at least 3 times a day, every day. To learn how to do this exercise really well, check out Gilles Marin’s SUNNING CD available on his website. Gilles was one of my first teachers who helped me to learn how to manage and master my emotions. According to Chinese medicine, all emotions affect different parts of our body, and in particular different organs and organ systems. When we have negative feelings and don’t clear those feelings from inside of us, they literally get stored inside of us. Feelings buried alive never die. When these feelings build up over time, eventually they start to affect cellular function even to the point of creating severe illness. We must learn to get in touch with our bodies and notice how we feel in our body, not just our head, when we feel emotions. Worry affects the stomach and spleen which is why we say “I was sick with worry”. Anger affects the liver which is why we say “I was livid with anger”. Fear is a cold emotion and affects the kidneys which is why we say “I was frozen with fear”. Our emotions literally affect our physical body, altering our physiology and chemistry. Feeling ‘bad’ also affects us mentally, bringing negative thoughts, which in turn affect how we feel; it’s a vicious circle and everything is interconnected. We must learn to feel where are emotions come from within our body, and give ourselves permission without judgement to feel our emotions so they can transform and pass through. The only reason they ‘stick’ inside of us is because we are resisting them. It’s OK to have feelings – you are not a bad person to feel any feeling. Just learn how to process them and watch your life transform! Want to learn how to manage and master your emotions? Introduction to Emotional Mastery Series – Learn why it’s so important to master your emotions and why your health, happiness and success literally depend on how effectively and mindfully you deal with your feelings. Emotional Health Series – Learn the connection between stress, emotions and illness, and how to clear illness by clearing your emotions. Smile your Way to Inner Peace Meditation Series – Learn how to clear negative emotions of anger, sadness, fear, mistrust (and more) and replace them with positive feelings of love, gratitude, compassion, trust, openness and joy (and more). Kim Knight does not diagnose, cure, heal or treat any person or condition. If you are experiencing depression or any other illness, please seek the appropriate medical advice. The above article expresses the views of Kim Knight and is not intended to substitute for appropriate medical advice. If you are on anti-depressant or other medication for depression, please consult your doctor before making any decisions about medication. This is most important!